Roughly 335 million years ago, during the Carboniferous period, Earth’s land mashed together to form Pangaea, the super-continent that would break up about 150 million years later into more manageable continents. The bit that became Scotland, then close to the equator, was a swampy tropical forest studded with shallow tropical lakes which were filled with amphibians. Also giant centipedes and spiders, but let’s not dwell on those. The trees (well arborescent or “tree-like” plants, we’ll go with “trees” here) were lycopods that grew to heights of 50 metres. They were tall and skinny with extensive root-like structures anchoring them to the ground. They aren’t around anymore. 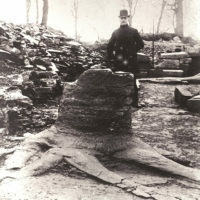 A thick grove of lycopods grew in Glasgow 330 million years ago, thriving until a river burst its banks, surrounding the “trees” in standing water. Eventually the trunks broke off above the water, leaving what remained below the surface. Sand filled the hollowed stumps and roots. It eventually became sandstone, retaining the shape of the plant. What was left of the hard outer layers of the stumps turned into a thin layer of coal which demarcated the stump sandstone from the rest of the sandstone forming around it. FOSSILS! Then a volcano covered all that up with what eventually became dolerite. A Fossil Grove stump accompanied by a suitably period fellow, shortly after discovery. Photo via Glasgow City Council, Glasgow Museums. The fossil stumps stayed where they were, but the continents moved around them. Our little grove rode Scotland as she moved slowly away from the equator. Dinosaurs walked on top of them, then people. In the 1880s some of those people were out-of-work Glasgow shipbuilders who needed employment. 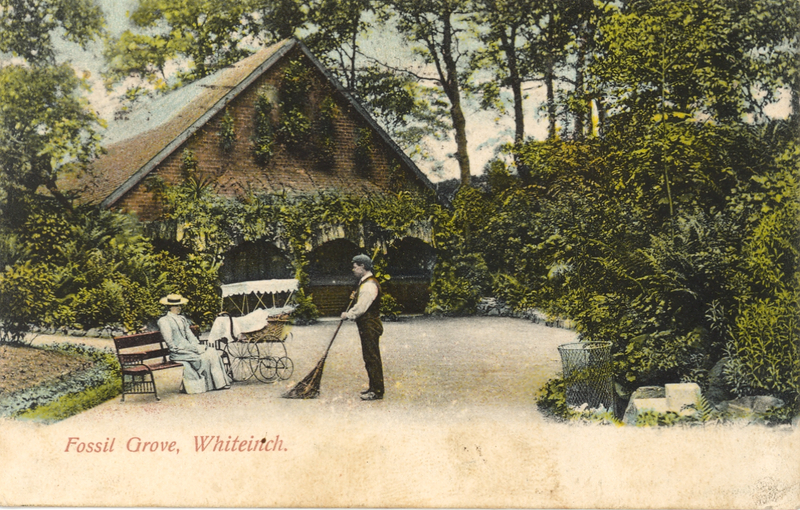 They were hired to develop a parcel of land to form a park to commemorate Queen Victoria’s golden jubilee, what became Victoria Park. In 1887, as part of the park project, they modified a disused dolerite quarry to make a channel for the road, digging into the sandstone beneath. As they dug deeper they encountered what was once the lycopod grove, and because of the thin layer of coal separating the sandstone that formed in the stump from the sandstone that formed outside of the stump, the rock fell away in the form of the inner portions of these “trees”. 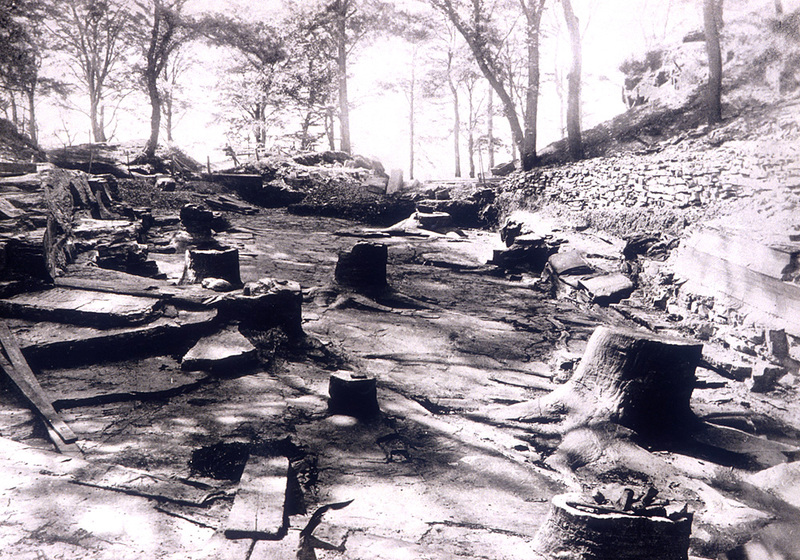 Eleven lycopod stumps with their “roots” spread wide were located, plus an 8 metre fallen trunk. Our Glaswegian Victorians were intrigued. I visited the Fossil Grove for the first time today, although I had tried to see it before. It’s only open from 12-4pm on Saturdays and Sundays in spring and summer and my previous poorly planned attempt to see the fossils failed as it was executed on a Tuesday morning in late autumn. Today was one of the few sunny days of the year where Glaswegians attempt to get their quota of vitamin D, and I fancied a day at the park. I scowled at a flock of surly swans, ate an ice cream, fell asleep on the grass while reading, and saw some fossils. It was tops. 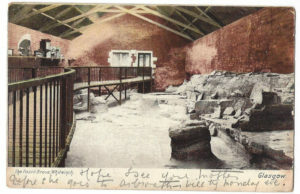 Postcard inside the Fossil House from 1906. Fossils are cool, sure, but once you’ve read all the signs, got your eye full of stump, and had a deep-time moment where you realise place both changes and stays the same (whoa, deep…*licks ice cream*), you’re pretty much done. What caught me, though, were the preservation decisions made about the place. 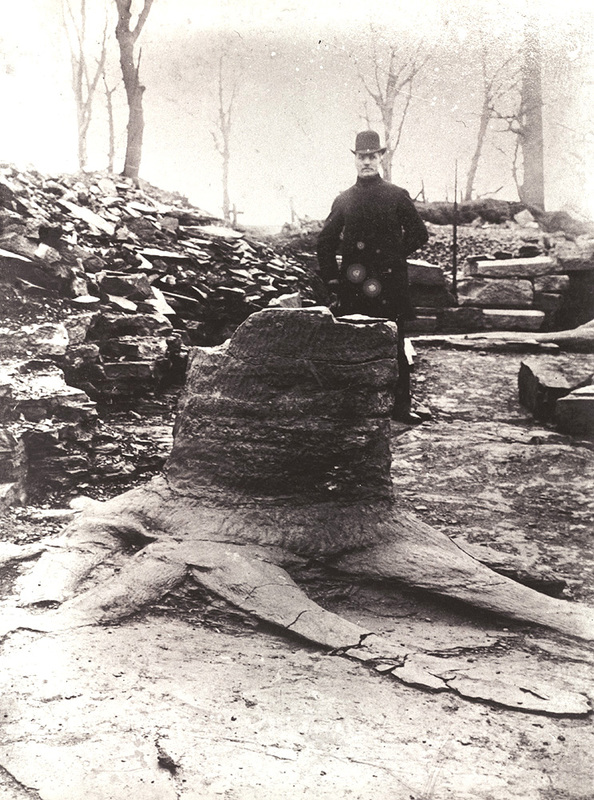 Instead of moving the stumps to a museum, Glasgow decided to preserve them in situ, exactly where they had been for 330 million years. Who are we to bend the stumps to our ephemeral human will? They’ve got millions of years on us. They aren’t going anywhere. It helped, of course, that the stumps were found in land designated to be a park. Road plans were changed slightly and plans were put in place to build a structure to protect the stumps from Glasgow’s modern weather. 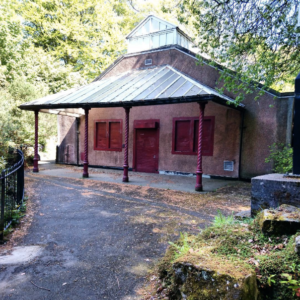 On 1 January 1890 Glasgow City Council opened The Fossil House, a purpose built structure which still covers the Lycopods. They called the whole deal, tucked away in the remains of the quarry which is now lush with flowering plants, “The Fossil Grove” and folks have been dipping in to stand among the “trees” ever since. The Fossil House, romance of deep time? Postcard from 1906, via Friends of Victoria Park. What about The Fossil House? Well it’s a heritage thing too, an interesting bit of Victorian-era preservation heritage. Yes, we are well into needing to preserve the heritage of preservation. 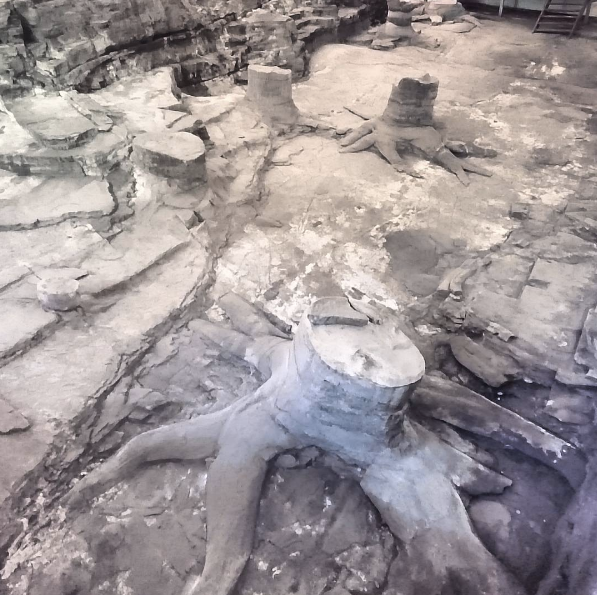 The Fossil House was once really quite cool looking, but now it isn’t in the best of shape. Apparently it was hit by a bomb during the Clydebank Blitz which seems to have mostly ruined the roof but, seemingly, not our lovely stumps. Modifications followed. It’s all pretty dingy. 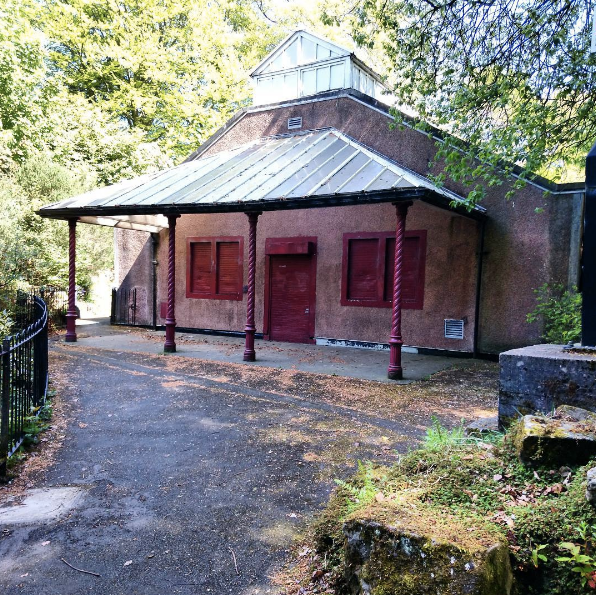 Around 2012 there seemed to have been some activity, a push towards some sort of refurbishment or even replacement of The Fossil House. The replacement plan makes me sad: not a trace of the Victorian preservationist zeal that kept the grove in place. Yick. The problems with the current building came up again in 2014, seemingly with no resolution. Now in 2017 the site is being laser scanned, again, with an eye towards trying to figure out what to do. I’ve spent the past two days writing about archaeological context for a non-archaeology crowd, trying to be clear and concise, explaining the concept in as few words as possible without losing a sense of importance and value. Thinking about context in the grander sense, I can’t help but think that there is value in leaving some things where they are and letting everything else move around them. That some sort of permanence can be rooted in the centre of flux and change, and that allowing at least some of that permanence to continue is a noble, even sacred endeavour. The world has literally changed around our fossil grove, yet there they are still in place. Are they in context? No. But they are context. Trust me, that all made sense while I dozed in the sunshine.